It's something of a cliché, albeit a fair one, that opera is an old fashioned and stuffy genre of theatre in need of some reinvention. With this production from company Silent Opera, director Daisy Evans aims to drag opera kicking and screaming into the 21st century, adding a twist of technology to bring the action quite literally closer to our ears. It's to make opera more accessible, more exciting and innovative, and more attractive to a younger audience. It's ironic, therefore, that in many ways this production does the opposite. The thrill of a silent disco has long since faded, often employed just to keep the noise down after bedtime. Incorporating headphones into an opera performance is simply another gimmick in a long line of pretentious opera productions. That's not all - this is immersive too! 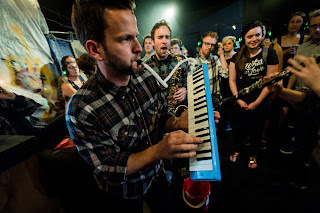 The idea is to bring us into the action, but for the most part it occurs in crowds we cannot see through, in cramped spaces we fit into uncomfortably, and even behind the audience when we're all sat facing the wrong direction. 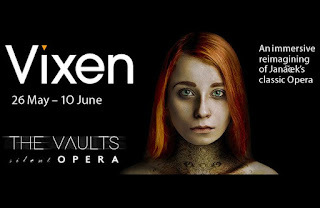 The grubby walls and floors of the Vaults do make for a fitting setting for this clever reimagining of Janáček's The Cunning Little Vixen as a fable of homelessness and sexual abuse, but for the most part you're left straining to see as you piece together the threadbare narrative. Fitting the modernised narrative are new electronic musical arrangements from Max Pappenheim and Stephen Higgins that bring a technological twist to the score alongside the headphones. The cold synthesisers marry well with the atmosphere; by comparison the recorded orchestral moments feel overly sweeping and hyperbolic. Despite the awkward staging there's an intimacy to the use of headphones, but having someone sing right in your ears while they're stood far away (or aren't visible at all) just feels strange. It begs the question: why listen to this intricate and interesting score through tinny, crackling headphones when it could be live? The singing is mostly excellent. 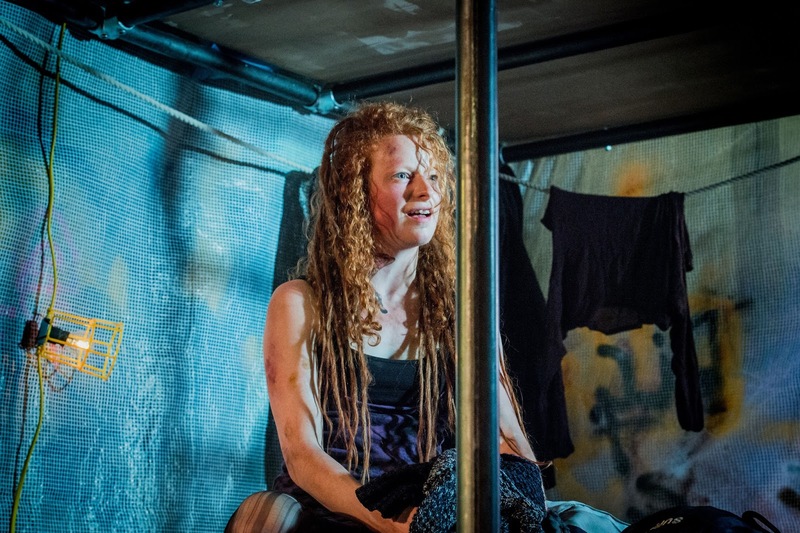 As the titular vixen, Rosie Lomas cunningly manoeuvres between a sweet soprano and jagged aggression to match her diminutive figure, spiky attitude and tail-like matted red dreadlocks. She's matched by the effortless tenor of Robin Bailey as her romantic counterpart. Yet this is a heavily condensed version of the story that leaves no room for character development. Lomas is a striking central presence, but we never really engage with the remaining creatures. Despite its flaws, this is a brave production. I'm all for embracing the use of technology and inviting new audiences to opera but not at the expense of the music or the storytelling, both of which suffer here from needless gimmicky barriers that simply left me with a headache. 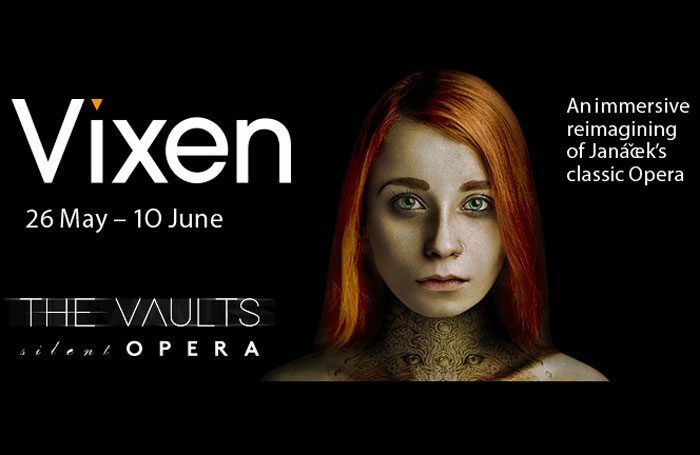 Watch: Vixen runs at The Vaults until 10th June.